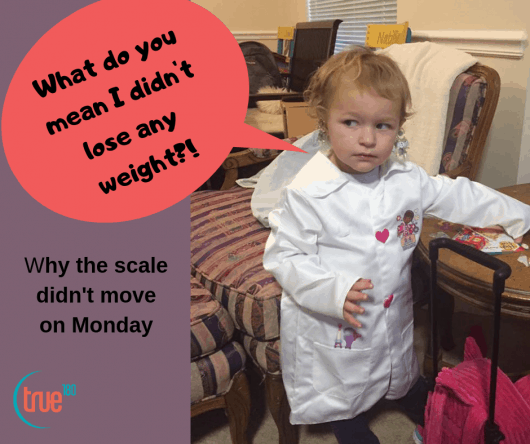 Why Didn’t The Scale Move? You worked very hard at changing the way you eat, showing up to your workouts, drinking more water, etc. However, on Monday morning when you stepped on the scale it didn’t move. Why? If you’ve ever tried to lose weight then you’ve had this frustrating experience at least once. When you’re frustrated it’s important to be suspicious of your own thinking because this is when we are most gullible. One dimensional answers (“it’s the carbs!”, “it’s the fat!”, “its my hormones!”, “I just can’t lose weight!”) are very appealing when we’re upset, but they are usually bait in a trap. These overly-simple ideas are alluring because they appear to bypass the need to do the hard, slow and frustrating work of critical thinking followed by trial and error. (emphasis on error.) However, these overly simple ideas will almost certainly fail you, and keep you bouncing from overly-simple idea (i.e. keto diet) to overly-simple idea (i.e. some brand of cleanse). Short term fluctuations in weight are mostly net changes in food and water. In other words, the scale is showing you the difference between the water and food you’ve consumed vs. what you’ve pooped and peed out. This can be a 5 pound swing in a day. 1 Liter of water is 2.2 pounds. On average we eat 3 to 5 pounds of food per day. Eating out – restaurant food will have 2-5x the salt of what you make at home leading to short term water retention. Constipators – traveling, not getting enough sleep, not getting enough fiber, and not getting enough water can all slow your elimination and make you weigh more. Medications and hormones – there are normal monthly fluctuations that move the scale, and many prescription and over-the-counter medications will impact elimination and water retention. One week isn’t enough time to see if the details of what you are doing is working. Consistency: You’re not really doing anything if you’re doing everything. If you’re changing things too often then you can’t tell if what you’re doing is working. Patience: your appearance does not determine your value. It’s easy to feel that way given the messages women receive about their appearance. This misinformation is behind the drive to get results yesterday. If you’ve been consistent and the scale hasn’t moved, then it’s fair to say the details of what you’re doing aren’t working for you. There are no new antiques: how much you weigh a month from now will be the difference between the calories you’ve taken in vs. the ones you’ve expended. This is true even if your fitbit and myfitnesspal aps tell you different. Fitbits (and similar devices) are very useful for increasing awareness of NEAT, however the calorie counts they give are wishful thinking. Most of the time you want to disconnect your fitbit from myfitnesspal. My Fitness Pal can be a very, very useful tool to help you be more aware about how much you’re eating, help you plan for an indulgence, etc. Eating out: the calorie counts at most restaurants should be taken with a few grains of salt. You need to make some special requests at the places you frequent, such as “no oil” when they’re cooking your eggs or veggies, or whatever. If the chef has a heavy hand with the oil, that can be a few hundred extra calories you didn’t realize you were eating. Snacking (or eating too frequently): the more often you eat the more you eat in terms of total calories. Research has shown this repeatedly. As you can see here snacking accounts for all of the extra calories Americans have consumed during the obesity epidemic. Some people also find that eating less often (some sort of intermittent fasting) makes it easier for them to feel good on fewer calories. NEAT. Our environment nudges us to be more and more sedentary. No matter how much you exercise, if you are completely sedentary outside of workouts, it is very hard to lose weight and keep it off. This is especially true for women. We live in a society that values “More! More! More!” and it can be very difficult to remember that eventually enough is enough, at least for now. (Check out this amazing article on the disease of more.) “More” is exponentially more expensive – it’s important to be aware of how much it costs to have an actual 6-pack. Maintenance is a worthy goal, and something to be proud of. As one wise person, who’s name I don’t remember said, “the hard thing about hard things is that they’re hard.” However, taking care of yourself is 100% worth it! Skipping A Workout What Difference Does It Really Make? Leave Your Body Out of This!